Yousof Sultani was born and raised in Northern Virginia. He graduated from Virginia Commonwealth University with a BFA in Performance. While in school, Yousof performed as "Aaron the Moor" in Titus Andronicus, as "Valere" in La Bete, and "Dr. Seward" in Dracula. He also performed in Richmond Shakespeare Festival at Agecroft Hall inHenry V and also the Richmond's main stage production of Amadeus. His favorite role so far was performing as "Hamlet" at the Shakespeare Theatre Company in D.C. through TEXT ALIVE! 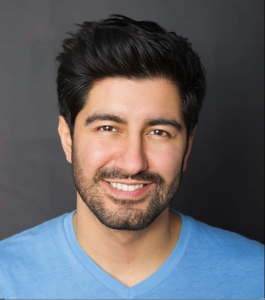 In his junior year of college, Yousof was selected and given a scholarship for the American Theatre Wing's Springboard NYC program and had the privilege of learning from John Rando, David Capparelliotis, Randy Lutterman, Peter Francis James, Neal Patrick Harries, Martha Plimpton and Leah Gardiner. Yousof moved to Chicago along with a group of his fellow graduates and they started a theatre group called the ALLUVIUM GROUP and present work under this banner. Outside of performing, Yousof enjoys playing 2nd base in the Chicago Theatre Softball League with the Goodman Theatre, and also plays Quarterback for their football team against Steppenwolf annually. He can also spends his time creating music, taking acting classes, attending shows and watching movies. He is ecstatic about being a part of Gray Talent and is eager to continue molding and improving his craft. Joseph will be seen next as "Aidan" in Silk Road Rising Theaters production of 100 Flowers Project.